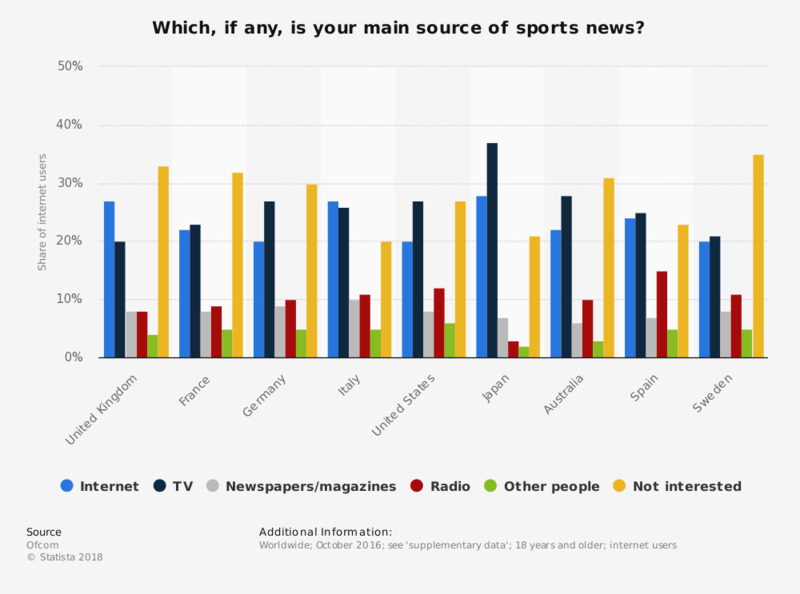 Which, if any, is your main source of sports news? The statistic shows sources of sports news for internet users in selected countries in 2016. Among internet users from the United States, 27 percent named TV as their main source of international news, whereas 20 percent stated the internet was their main source such news. The question was phrased by the source as follows: "Which, if any, is your main source for the following information? sports news"
Base sizes in October 2016: Australia = 1,007, France = 1,008, Germany = 1,010, Italy = 1,032, Japan = 1,011, Spain = 1,016, Sweden = 1,000, United Kingdom = 1,000, United States = 1,016. Do you follow the news on one or more women's sports?